The Salus IT500 Smart Heating Thermostat and Boiler Control is a complete package that includes everything you need to control your heating remotely. 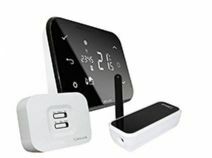 The Smart Thermostat is a free standing battery powered Thermostat that connects wirelessly to the hub unit. The hub is connected to your wi-fi router with a LAN Cable. In turn the hub connects wirelessly to the boiler controller which can control most heating devices. Once the kit is installed it can be easily connected up and then controlled using the Salus App on a smart phone or using the Salus web page.